You might have noticed I’ve been a little quiet on the blog other than pregnancy updates, and this is why. Our family recently experienced another heartbreaking loss and I haven’t really been able to find words. On June 1st, Jonathan’s phone rang around 6:45 in the morning. I heard him answer and could vaguely hear what the person on the other end of the phone was saying. I thought I heard the man on the other end say “You need to get up here; your mom passed away last night” & I heard Jonathan reply with a solemn “Okay” before hanging up the phone. I sat up immediately and asked him if I heard that right. I thought surely I must have misheard and there was no way he really meant Donna. We had both been talking to her all weekend and she was fine. When Jonathan confirmed, my heart sank and I felt like I was going to be sick to my stomach. Just a year ago we received a similar call that my brother had passed away in his sleep. I can’t explain the sick feeling that washes over you when you get that kind of news. It’s one of those calls you never want to receive. Donna was only 54. She passed away very suddenly and unexpectedly from an aneurism. Her sister passed away several years earlier from the same thing. She told us she had a catch in her left shoulder that weekend, but I honestly assumed she pulled a muscle (because she worked in home healthcare taking care of an elderly woman). Other than that, there weren’t really any signs or symptoms that we knew of, and losing her so unexpectedly made it even more heartbreaking. It still doesn’t really feel real. Jonathan is from a small town and everyone knows Jimmy & Donna and the Butler family. Everyone in the community really rallied around in support with love, meals, visits, and prayers. The prayers especially meant and still mean SO very much. In losing Michael and now Donna, I know that peace and comfort they bring during a time of such overwhelming sadness- a peace that can come ONLY from the Lord. Everyone covering the family in prayer is appreciated beyond words & the one of the most helpful ways to minister to a hurting family. Jimmy & Donna were married for 37 years, and I cannot imagine the emptiness he is feeling without her. I know there is a void and loneliness beyond my comprehension. I think my heart breaks most for Jade though. They were best friends, and my heart aches for her every time I think about her not having her mama around. The visitation was on Tuesday, June 2nd and the funeral was on Wednesday at 2. The funeral home did a wonderful job with everything, and the preacher did a beautiful job remembering her and sharing a message of hope at the funeral. We are so thankful to know that Donna knew the Lord as her Savior and it brought joy hearing the preacher share that testimony at the funeral. It was an exhausting few days, but the Lord sustained and Jonathan, Jimmy, and Jade all handled it with such grace. I know they definitely appreciated all the love and support from friends, family, & neighbors. And we were thankful Kade stayed put too. Jonathan is pretty private when it comes to this type of thing, but all of the texts, calls, visits, and encouragement has meant SO much to him. Thank you to everyone who has reached out to show their love. His unwavering faith during all of this has been so inspiring. Even though it hurts and we don’t understand, he trusts the Lord’s plan. Jon is such a rock, and because he isn’t as vocal about his faith, sometimes I forget just how strong he really is…but I am so thankful for that about him. My heart is so sad that our kiddos will grow up without Donna. She was such a LOVING grandma. That’s what everyone said at the funeral home too- they talked about how beautiful she was and how much she LOVED her family!! And that is so true; she was so good to Jase and called/texted all the time between visits to check on him. She loved to spoil him. We have a sweet recordable story she made for him, and we absolutely treasure that thing! I am so thankful she took the time to record it and the boys will have that to remember her forever. Our hearts are still sad in losing a beloved mom, grandma, and mother-in-law. She and I really became close over the last 2 years since having Jase, and it just won’t be the same without her. Holidays will be especially tough and there will be a void without her here. Still, we are so thankful for the time and memories we did have with her. 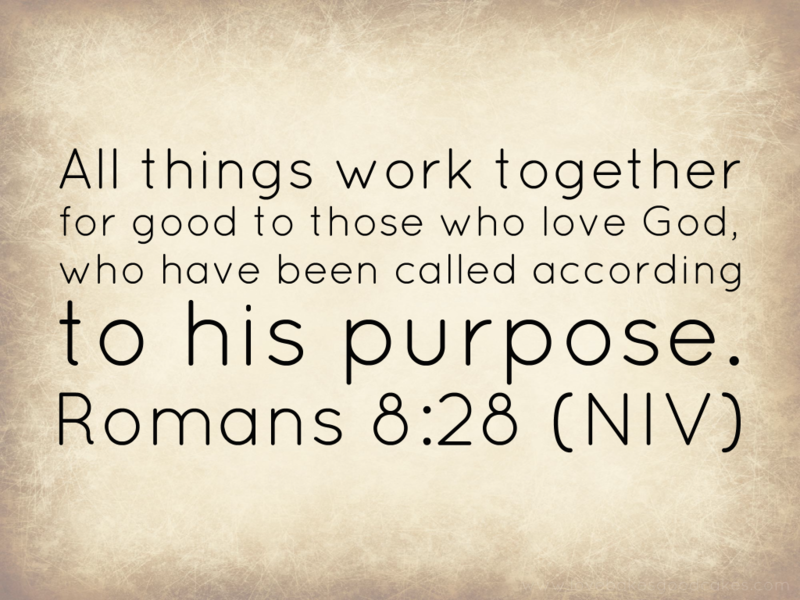 Romans 8:28 has ministered to my heart. And God reminded us of His strength and peace that morning too. RIP Donna. You will forever be in our hearts. I am so sorry for your loss Danielle!!! Nothing prepares you for things like this. So thankful your faith in the Lord allows you and Jonathan to get you through day by day! I know it's what helped me! Sorry for your loss. Thankful for you and your blog. My sister just had a miscarriage at three months,but your bible verse is a reminder God is in control. Thank you for your post. God bless your beautiful growing family.Thank you again. My condolences on your loss Danielle....With so many stories of horrible mothers-in-law, it was nice to hear that you two loved each other and got along. My heart is sad for your boys....Despite their grandma not being here physically as they grow up, they will feel her love for them and presence through pictures and stories about her. My grandfather (my mother's dad) died when I was three years old. so I only have two actual memories of him. I always heard (and still do do) stories from my mom, grandma and uncles about how much he loved being a grandfather and the things he let me get away with doing. It brings a smile to my face every time and I feel like I grew up with him. I appreciate your sharing this on your blog. No matter how close we are to God, this is a subject none of us wish to have first-hand experience in. I will be praying for you and your family!